Red - a color that is suppose to increase your appetite - seems to rev up my creativity. Or at least it makes me think so. I keep bits of it in my workspace and here and there around the apartment. Red makes me happy. I love to use red paint - I even like the names of the hues. 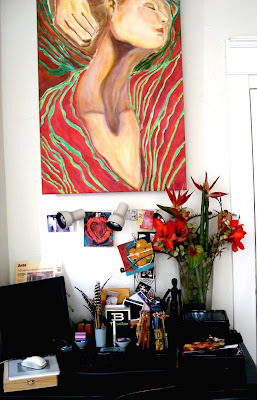 My work desk and red inspiration art. 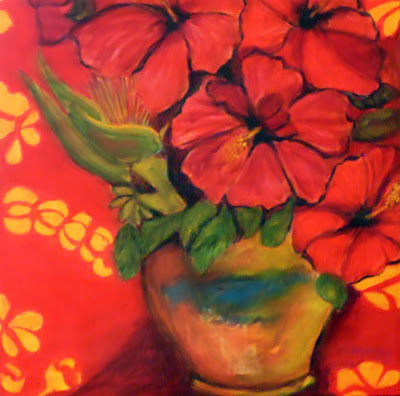 "Hibiscus on a Red Cloth" - 18 x 18 acrylic on cradled art board - $400. 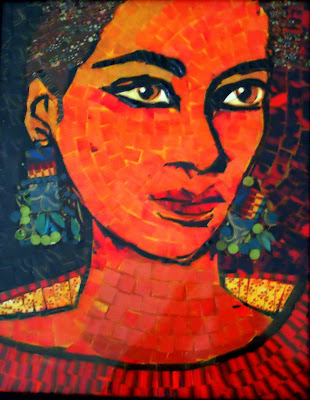 Below: 10 x 12 paper mosaic on art board - "Girl - Eyes - Earrings" - mahogany framed and for sale - $300. 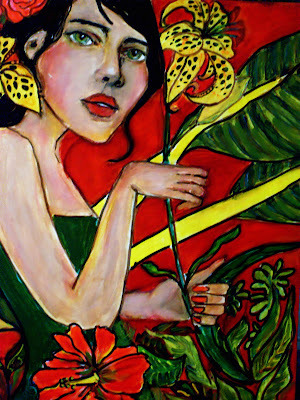 Below: "Tiger Lily" - Acrylic on art board - 16 x 20 - $400.